What is it? Scouting's Advanced adult training course. Begun in 1919 by Robert Baden-Powell, founder of Scouting, Wood Badge has evolved to give leaders the skills they need to strengthen Scouting in meaningful ways. 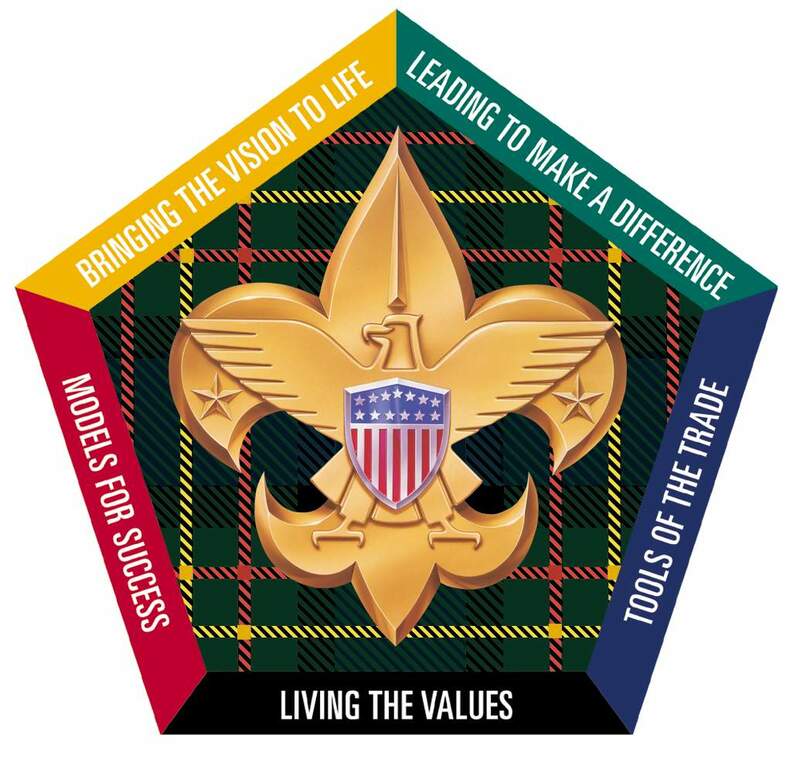 21st Century Wood Badge places special emphasis on team development and how to tailor your leadership skills to meet the needs of the group whether youth or adults. Six days in length, the course covers leadership skills, organizational tools, and participatory activities based on the best of Scouting traditions and the best of team development approaches. In addition, participants will enjoy the fellowship of learning alongside many other volunteers and professional Scouters and will have a great deal of FUN! Apply contemporary leadership concepts to our values-based movement. Understand Cub Scouting, Boy Scouting, Venturing, and Varsity as a family of values-based programs providing age appropriate activities for youth. Revitalize your commitment to Scouting through fun and fellowship in a learning environment. Many Scouts consider Wood Badge to be one of the peak experiences of their Scouting careers. In the United States, it has served as a source of training and inspiration to many thousands. In return, Wood Badge participants have affected the lives of millions of America's youth. When: This course takes place on 2 weekends, September 22-24, 2017 and October 13-15, 2017 - 7:30 am Friday until 4:30 pm Sunday on both weekends. There is also one patrol meeting between the 2 weekends. Attendance is required at all sessions. Who: Any registered adult Scouter trained in their current position in a unit. How Much: The fee is $220.00 per person. Fees are refundable in full if a Scouter gives notification by September 1, 2017. Note that many units, Chartering Organizations, and Employers will contribute all or a portion of the course fee. Scholarships are available from other organizations. How Many: The course is limited to 48 participants with registration available on a first-come, first served, basis. Registration is open and will remain open until the day before the course begins. Fees are refundable in full if a Scouter gives notification by August 22, 2017. Note that many units will contribute all or a portion of the course fee and scholarships are available from other organizations.